Celebrate the holidays in Cougar style with the WSU Blended Learning Holiday Wine Tasting! Spend the evening sampling WSU Blended Learning wines while visiting with students and staff in the Viticulture and Enology Program. The WSU Blended Learning Holiday Wine Tasting will feature 10 wines from the student-made series. The first-time event will include wine tasting, hors d’ouerves and dessert catered by Birch & Barley, nonalcoholic beverages and a holiday-themed photo booth. Tickets for the event can be purchased in advance or at the door at the Brelsford WSU Visitor Center. Wine tasting tickets cost $20 and include a 1-oz. tasting of the 10 wines, commemorative Brelsford WSU Visitor Center wine glass and entry into the event. Proper identification will be required for the wine tasting and purchase of tasting tickets. Event entry will be offered at a reduced rate of $10 to individuals under 21 or who do not wish to participate in the wine tasting. WSU Blended Learning wines featured in the tasting include: Barbera, Sparkling Brut, Durif (Petite Sirah), Dry Riesling, Dry Rosé, Grenache, GSM (Grenache, Syrah, Mourvèdre), Sauvignon Blanc, Head-Trained Syrah and Loose VSP Syrah. 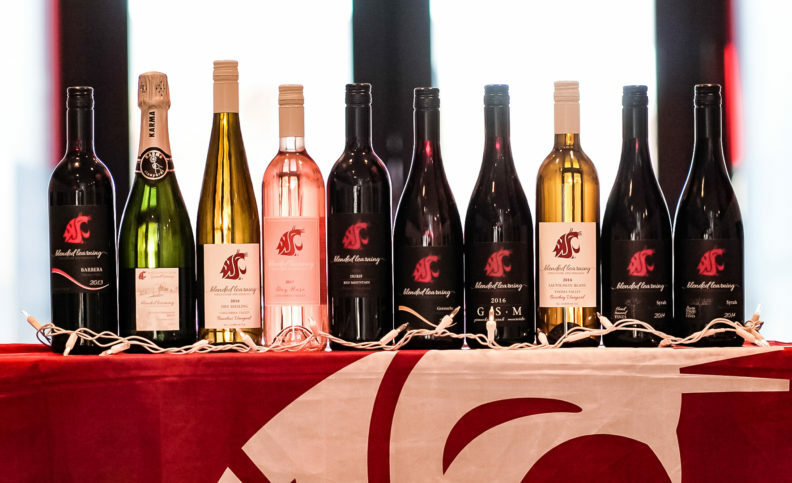 WSU Blended Learning wines will be available at a 20 percent discount for attendees and will include free Cougar-inspired gift packaging for two or three bottles. Gift packaging features a crimson ribbon with a Cougar holiday gift tag. More information is available at visitor.wsu.edu, visitor@wsu.edu, 509-335-4636 or by following the Brelsford WSU Visitor Center on Facebook, Twitter and Instagram.